Europe is marching blindly into the first world war. Berlin is caught in a storm of nationalism with parades and speeches, queues reaching down the streets where the Army recruitment offices cannot keep up with the volunteers. No one anticipates the carnage to come, except one man. Albert Einstein sees the cauldron that Europe is slipping into, made worse when his university colleagues begin work on poison gas to ‘shorten the war’. He is also struggling with the collapse of his marriage in the wake of an illicit affair with his cousin, whom he reluctantly agrees to marry once his first wife and two sons are safely ensconced in Switzerland. Increasingly isolated, Einstein finds his academic work sidelined. Few people will entertain his outlandish new way of understanding the universe. He sees it as an invisible landscape of hills and valleys that determine the paths of the celestial objects, but he cannot quite pull the mathematics together. He needs a breakthrough, some evidence to prove his vision, but the only man likely to provide that is now a prisoner of war, facing execution. Unbeknownst to Einstein, in the trenches of the western front, a devoutly religious young Belgian is feeling the lure of his work. Georges Lemaître vows to become both a physicist and a Catholic priest if he survives the war. When the war ends, Einstein does make his breakthrough and is thrust into the international limelight. Simultaneously, Berlin becomes dangerous because of the anti-Semitic feelings fostered by the German government to explain their defeat. Crisis is reached when prominent German Jews become targets for assassination; Einstein is on the list. He must also deal with the realisation that his marriage breakup has claimed his youngest son’s sanity. Guilt-ridden, Einstein unexpectedly rediscovers the appeal of his first wife’s fiery spirit, especially in the wake of the domestic dullness of life with his cousin and her daughters. When Einstein can least afford the distraction, Lemaître confronts him with a startling concept: that buried in the maths of Relativity is a beginning of space and time, a moment when the universe came into existence, a day without yesterday. But can the priest be trusted? Or is he simply trying to foist a version of Biblical Genesis onto Einstein’s now world famous theory. To quell the chaos of his life, Einstein must make irrevocable decisions. He must choose between his first and second wife, between his sons and his stepdaughters, and between his hatred of religion and a man who seems to understand Relativity more deeply than Einstein himself. Inevitably, his choices will create winners and losers, with the losers perhaps those who least deserve to be victims. 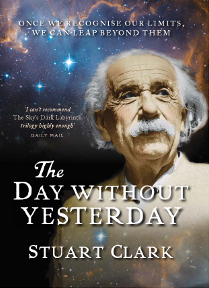 The Day Without Yesterday is based on the true story of Albert Einstein and George Lemaître, the two men who forged our modern understanding of the cosmos.